I feel I have loads to share since I last checked in. I have begun commuting to work and have also had a slight accident but am still here to tell the tale. I am now an official biking commuter since I have started to travel to work on my Suzuki Van Van. I decided that enough was enough and going around the block near where I live. I managed to persuade Angus who works with me on the site to go with me to get my bike from home so I could ride back to work. Due to the bad weather I mentioned in my last blog I had not been out properly for a couple of weeks so I was rusty but got back to work in one piece. And so over the week I have been gradually building up the speed on the corners and getting to work okay. The only problem was one junction on to a main road where I did not have the confidence to find the biting point and for a couple of mornings I managed to get stuck in the road for a couple of seconds before all was okay again. So I am merrily building up my miles and then last Tuesday it happened. I head out of the village where I live and up the hill to a T-junction. Now normally I stop, do a look left, right, left, right and am ready to go. 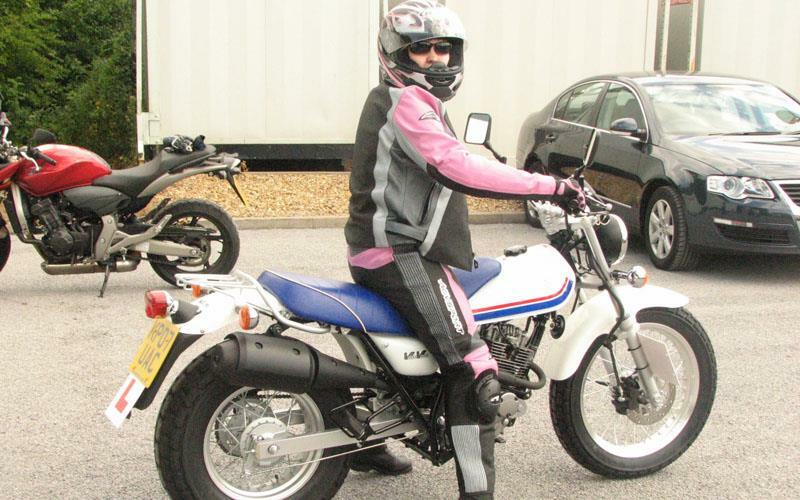 But this time I think I let the clutch go too soon and the next thing I know the handle bars are so far round it’s not true and I am heading for the floor. He told me when he was in the RAF that they were told to get back in the air after any mishaps and that was what I was to do. He followed me for about a mile to make sure I was okay before heading off at a much faster speed than me. And so I then had to make my apologies to Suzuki for dropping their lovely bike on the floor and promised to inspect it fully at lunchtime. I was so lucky, the only damage was a slight scratch on the exhaust cover, throttle and brake lever. Things have been going well since then and it’s just been a case of building confidence and speed before my baby goes back to Suzuki. It’s amazing what you take for granted in a car and now have to think about so much on a bike like changing gear, indicating, looking in the mirrors and even steering. None of these I really notice I think about too much when I’m driving but you focus so heavily on everything on a bike. I guess this will become easier over time.